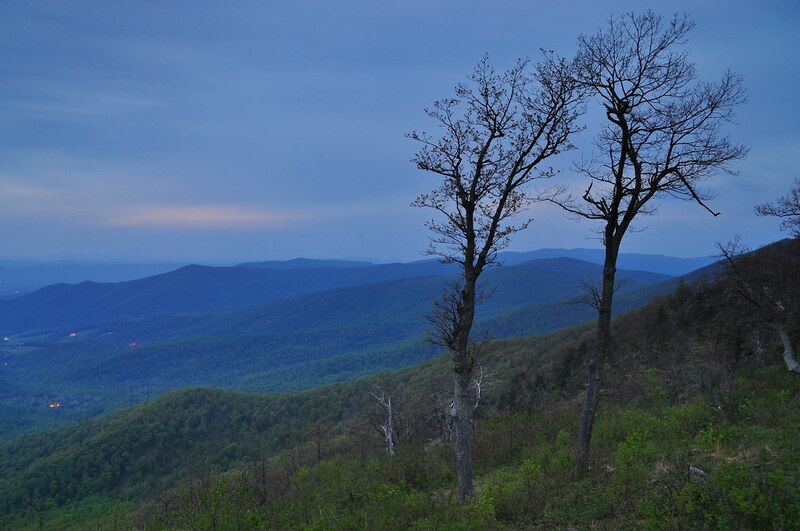 Though assailed by millipedes of tremendous proportions, I enjoyed the solitude of the mountains at perhaps my most favored Shenandoah overlook, Jewell Hollow. Both Aidan and Fiona were bundled and asleep in the car, and as the last vestiges of sunlight faded in the West, I finally stowed my photographic gear after one final exposure. Perhaps it was purposeful that I forgot the book I had been reading, and was forced to turn to Shenandoah 1862: Stonewall Jackson's Valley Campaign. I've long been interested in all aspects of the American Civil War, having grown up only a short drive over South Mountain (indeed the last Northern extension of the Blue Ridge) from Gettysburg, often called "The High Water Mark of the Confederacy." However, my curiosity has waxed over the years as my travels and readings have gained more depth. Finally, my residence in Northern Virginia these past few years has kindled my interest in historical information regarding the Southern forces. Names of long-dead Confederate generals and politicians grace the names of streets and stores from Arlington to the Blue Ridge and beyond, so it is impossible to avoid their very names in conversation over something as normal as driving directions. Of course, I have also been quite concerned for years with my beloved Appalachian mountains, and recently with the Blue Ridge in Shenandoah National Park. I have determined to learn everything that I can about this magnificent region, and have thus begun to take library items on many aspects of the subject. My search soon yielded a few items on the famous exploits of Stonewall Jackson in the Shenandoah Valley. I opened one of these books for the first time on the crest of the Blue Ridge, and as I read of the strategic significance of the valley, and of its ill-equipped troops from the farms and towns, I was able to look to my left and see many of the places described. The Shenandoah Valley was a great producer of crops and war materiel for the Southern cause. It has been described as the breadbasket of the Confederacy, but it also supplied iron and other raw materials. Finally, its river and rail network were of vital importance for military transportation away from the coast. As I read these details from my superior vantage, I experienced the sublime simplicity that I first came to understand via the writer Robert Emmett Ginna, whose travel tale The Irish Way illustrates the delight of reading about a subject while quite literally surrounded by it. The author, a voracious reader, often told of his quiet time with a tome picked up along the way, and just how fitting it was to appreciate a book, and a place, in this way. It may be difficult to understand for some, but for me a quiet, uninterrupted bit of reading is one of life's finest little pleasures. With the night wind finally blowing the insects away, and the stars twinkling above, this brief moment was almost perfect. Of course, I had to leave eventually, and we did come home via the long Piedmont highways at last. The kids slumbered peacefully, and I was at peace too, knowing that I will have many more nights under the stars of Shenandoah.